Spin the Wheel of Chance found in Lobby and collect your free bonus. Opens once every 8 hours for all players regardless of their XP level. As you play every day 7 days in a row, you get more and more coins for free. Once you’ve played 7 days in a row, count days start over again from day 1 to day 7. 1. Just drug the coin with your finger to your square of choice. 2. Click on a line from the options below to win secondary winnings. The closer your bet is to the winning square – the more you earn from secondary winnings. 3. Click Play and GOOD LUCK. 4. During the game you can increase your chances to win by using various special Boosters. All boosters are designed to increase your chances to win by manipulating the marker’s moves, each booster in its unique way. you can activate each booster once per round. Some boosters will become available for use as you progress in the game and reach a higher level. Change the markers’ direction from right to left. Boost the marker a few squares forward. Moves the marker a few squares backward. Speeds up the marker for as long as you keep the green [+] button pressed. Slows down the marker for as long as you keep the red [–] button pressed. Blows up a few squares. less squares on the board in the competition. Adds another marker that moves in the opposite direction. Makes 4 additional markers appear at the end of the round, landing on 4 different squares, and adding 4 more winning squares. Win the game’s main/secondary prizes. play the Wheel of Chance located in the Lobby – Opens once every 8 hours. Win the amazing mini game Double Wheel of Chance, that opens once you reach a high enough level. Play every day 7 days in a row and get more and more coins. Get coins once you reach a new level. Simply go to SHOP and buy more coins. Through bonuses as your progress in the game. Each time you reach a certain level up. You can win diamonds by playing the surprising mini game “Game of Treasure Chests”, that opens once you reach a high enough level. The Treasure Chests game opens once you reach the Treasure Chests island shown on the map. 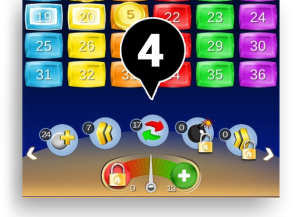 The Treasure Chests mini game consists of 6 Treasure Chests appearing in the same 6 colors as the 6 columns of squares displayed on the game’s board. 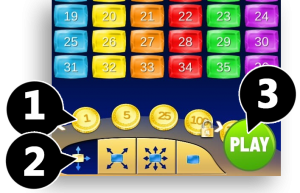 As the Game of Treasure Chests becomes available above the main game board, you place a bet on the board as usual, but now, whenever you win, a Star will show up beneath the colored Treasure Chests according to the color of your winning square. Once you fill the first Treasure Chest with 3 stars, you will be given diamonds as a free bonus. The Double Wheel of Chance game opens every a few levels up once you reach the Double Wheel of Chance island shown on map. The Double Wheel of Chance game consists of 2 Wheels of Chance. 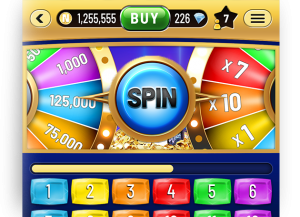 just click on Spin, and win the coins shown on the left Wheel of Chance multiplied by the number shown on the right Wheel of Chance.